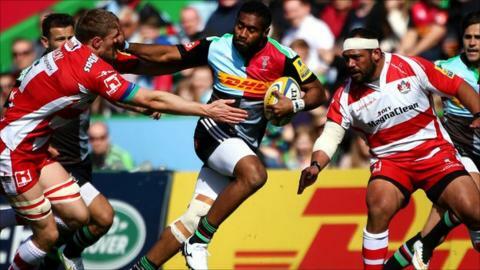 Late tries from Marland Yarde and Ollie Lindsay-Hague saw Harlequins come from behind to defeat Gloucester. Gloucester led 13-11 at the break following Billy Meakes' try and a conversion and two penalties from Greig Laidlaw, with a Charlie Walker try plus two penalties by Nick Evans for Quins. Charlie Sharples' try extended the lead but two Evans' penalties and one by Laidlaw made it 21-17 for Gloucester. Yarde and Lindsay-Hague rescued it while Dan Robson added a consolation. Quins struck first with Walker going over in the corner after a quick tap created space. Laidlaw and Evans traded successive penalties for 11-6 to Quins before Hook's wonderful dummy eventually saw Meakes crash through two defenders before bundling over. Laidlaw's conversion gave Gloucester a two-point lead going into the break while Quins prop Joe Marler also ended the half in the bin. Meakes' floated pass released Sharples, who had enough pace to go over in the corner, but two penalties from Evans reduced the deficit to a point before Laidlaw's boot stretched Gloucester's advantage to four. Sharples was sin-binned to see Gloucester reduced to 13 men, with Ross Moriarty also off the pitch, and Quins took advantage as Yarde joined the back of a rolling maul and touched down in the corner as the home side went 22-21 ahead. Evans' conversion was wide of the target but Lindsay-Hague sealed the game after Gloucester ran out of numbers with a converted try five minutes from time for 29-21, while Robson's try with 60 seconds left saw Gloucester earn a losing bonus point. "In the end, it was probably a little bit of a lack of discipline at the end of the second half that cost us the opportunity to win the game. "We have created those chances but haven't taken them and credit to Harlequins today, I thought the couple of chances they had, they scored from. "There was a 20-minute period where nothing really went right for us - with the ball, defending, some indiscipline - and that just gave Harlequins the momentum to come back into the game." Harlequins: Lindsay-Hague; Yarde, Tikoirotuma, Sloan, Walker; Evans, Care; Marler (capt), Ward, Shields, Easter, Robson, Wallace, Robshaw, Clifford. Replacements: Buchanan, Lambert, Marfo, Matthews, Talei, Dickson, Botica. Gloucester: McColl; Sharples, Meakes, Twelvetrees (capt), May; Hook, Laidlaw; Wood, Hibbard, Afoa, Savage, Hudson, Kalamafoni, Rowan, Evans. Replacements: Dawidiuk, Murphy, Puafisi, Galarza, Moriarty, Robson, Burns, Purdy.